View basket “Pink/Tangerine Lemurian Seed Crystals” has been added to your basket. 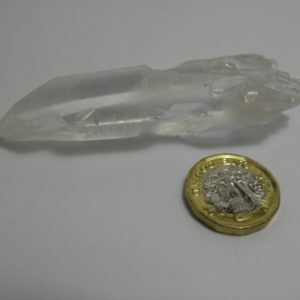 Approx 70 x 30 X 255 mm, quartz crystal point. 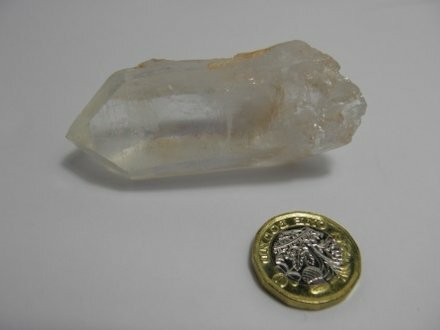 The photographs are of the actual Lemurian quartz crystal you are buying. Pink / Tangerine Lemurian Seed Crystals are amazing and the vibrations are “out of this world”. Even those who are not so sensitive to crystal energy have said that they can feel the energy transmitted from these points. Anyone who enjoys meditation or works with Quartz points in their healing sessions will enjoy owning one of these. Natural Pink Lemurians were discovered in one pocket of the same mine in Minas Gerais, Brazil where the Lemurian Star Seed crystals were originally found. The pale pink coloring is due to a dusting of Hematite during the growth process. This colouring is within the layers of crystal growth. The “New” Pink Lemurians that are currently available also have a pink to orange pink coating of oxidized Hematite. Lemurian Crystals are rarely transparent. They are easily identified by the parallel striations on one or more side of the crystal. The crystals are usually laser wands. They are often misshapen and twisted, with uneven sides and rough ridges and edges. They are not the beauty queens of the crystal world. What they happen to be hiding under that rather rough and ready exterior is the most powerful Intuitor energy in the mineral kingdom. Whether the legends are true or not, the value and power of these crystals is not to be denied. Lemurian Seed Crystals are said to have originated in Lemuria. This civilization, according to the legends existed in ancient times in the area of the South Pacific. The area is now beneath the sea. The Lemurians are believed to have foreseen a cataclysmic event, and prepared the Seed Crystals to preserve their knowledge and traditions. Legends tell us some of the Lemurians have departed the Earth for the stars and others inhabit the deep inner reaches of our planet, perhaps as light beings or spirits. The Lemurians are believed to have been a people much more focused on the emotional and spiritual world. The knowledge they seeded is primarily concerned with spirituality and communication across the light spectrum to beings of higher energy levels. This was carried forward in to Atlantean times. A Lemurian Seed Crystals are usually communicators. They are often discovered to have a high vibrations to establish communication with Spirit Guides and Angels and it for this purpose they are most recommended.